The journal Science has put up a commentary by Richard Kerr about 'actionable (climate) science', based on a conference recently held in Denver about how to frame the results of climate science so that they can be used by, for instance, 'a farmer in Uganda considering irrigating his fields can use to make better decisions in a warming world'. This piece is, in my opinion, exceptionally well balanced - I mean exceptionally or the journal Science. The take-home message is that, although climate projections roughly agree for some variables like temperature and at large spatial scales, they do not completely disagree for other variables like precipitation and at local scales. A reasonable rule of thumb is that agreement among models is better for thermal than 'hydrological' variables and better at large scale than at smaller scales. One has to keep in mind that 'better' does not mean 'good'. The conference discussed a practical example of climate projections for the Colorado River basin obtained by 16 different climate models driven by 3 different scenarios of greenhouse gas emissions. The projected temperature change for 2040 lies in the range 1-5 degrees Celsius, a very wide range indeed but at least all models show a warming with respect to present temperatures. For precipitation change the projected range is -10% to +20%. In other words, it is not possible to say whether the Colorado River basin will get drier or wetter by 2040. The projected range for 2100 is even larger from -20% to +30%. What can we say to the Ugandan farmer? The University of Cape Town has developed very nice on-line tool to quickly represent the IPCC projections for temperature and precipitation for any area in Africa (free registration required). 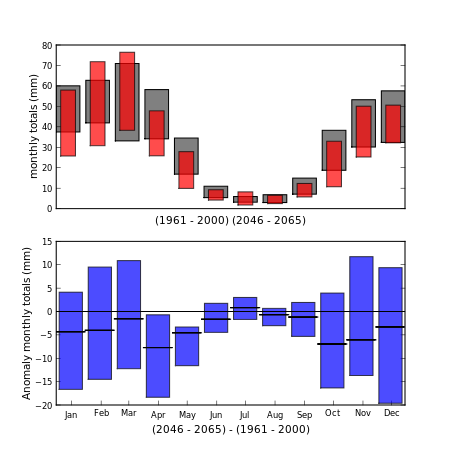 Instead of Uganda, I have chosen another location in Africa, Fes in Morocco, just to check weather or not I could confirm that IPCC models predict for North Africa severe droughts - as this seems to essence of other current debates between scientist and journalists . The mean of the projected changes tend to be negative, but my impression is that even when choosing the most pessimistic scenario, SRS A2, the model spread is large enough to encompass positive and negative precipitation changes which even alternate through the year. This allows anyone to go to the IPCC supermarket and cherry pick the model that better fits one's pre-formed believes. For Uganda, the model mean is closer to zero with also a quite large spread. The link to the UCT tool is bloggered. As soon as this started talking about "greenhouse gases", it left the field of science and became political propaganda. There is no greenhouse effect. The models that assume that effect are not based upon reality, and are entirely worthless; garbage in, garbage out. For those without a Science subscription, Kerr's article can be read in Google's cache ('View as HTML') of a mirror of Science mag hosted at a strange Ukrainian website called sokolovsky.org.